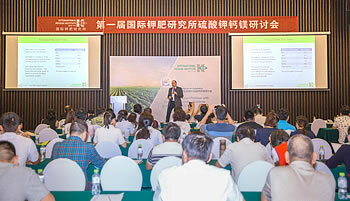 At the event in China, evidence of the positive performance of polyhalite, as Polysulphate, in a wide range of crops was presented to the highly interested audience. Eleven key speakers revealed results of Polyhalite research from China and elsewhere on a wide range of fruit, tuber, grain and leaf crops. Evidence from the podium was backed up with evidence from the field. The whole conference spent time looking at protected cropping of hami-melon with Polysulphate. This completed the successful presentation of the scientific, practical and commercial case for an increased role for Polysulphate fertilizer in many parts of China.